On my blog I recently reviewed a book called Hedge Witchcraft by Harmonia Saille, which is an excellent introduction to that form of traditional witchcraft. Her new book, Hedge Riding, follows on from it and offers an in-depth look at one of the most fascinating aspects of hedgewitchery - the practice of travelling in spirit to other realms. These are the realms of the ancestors, nature spirits, fairies and divine beings; collectively called "the otherworld". This form of travelling is a shamanic technique, and the term "hedge riding" is used because the barrier between the worlds is seen symbolically as a hedge. Hedge riding is a core practice of hedge witches, although they are usually also skilled in natural magic, herb lore, divination and folk traditions. There are many practical reasons for hedge riding, including contacting animal guides, communicating with the dead, gaining wisdom, healing and divination. Publisher Moon Books says on its website: "The hedge is the symbolic boundary between the two worlds and this book will teach you how to cross that hedge. 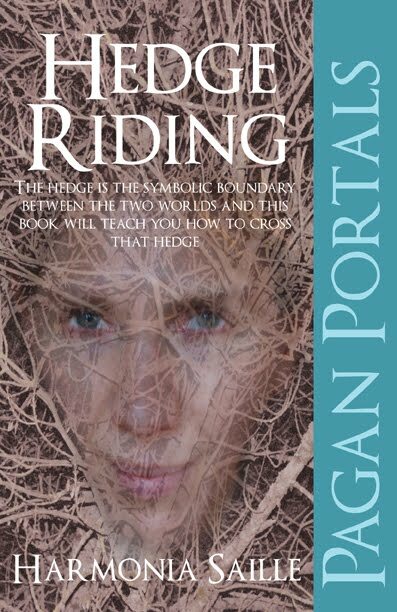 While hedge riding, the hedge rider’s consciousness travels to another place, the otherworld, which is also the realm of the collective unconscious. There the rider guided by his or her animal and spirit guides, encounters archetypal symbols and assimilates this knowledge to help guide her or him on their pathway." However, hedge riding is not easy. It is a skill that usually takes plenty of time and practise to be able to do at all, and also has some risks because the entities one may encounter in the otherworld are not always friendly. But, if you want to learn, I would recommend Harmonia's book as a good place to start. It is clearly written, without over-simplifying what is one of the most difficult aspects of hedgewitchery. She explains what the otherworld is like - normally depicted as being divided into the upper world of gods, the middle world of humanity, and the lower world of primal nature, as well as the underworld where the spirits of the dead can be found. She discusses the tools used to reach those worlds, including drums and rattles, but also traditional herbs. Harmonia covers the practical techniques required, but explains that one should learn to walk before one learns to ride. Meditation, visualisation and pathworking, while not being the same as hedge riding, are very good skills to master first. The book contains exercises in all of these. It also covers protection and grounding - essential before one travels to the otherworld - as well as importance of animal and spirit guides, and how find and communicate with them. Finally, the book shows how to put all of these techniques together to actually cross the hedge, through a series of experiential examples. Hedge riding is a subject that has not been widely written about in depth. This new book, in the Pagan Portals series, fills something of a gap in the market and I am sure it will sell well. Harmonia Saille is an author and practising Hedge Witch who holds workshops on the runes, faeries, hedge riding and other subjects. She lives in Ireland and is deputy editor of Ireland's pagan magazine Brigid's Fire. Her other books include Hedge Witchcraft and Walking the Faery Pathway.